So most everybody’s listened to NPR’s Car Talk, right? I don’t have one whit of interest in automobiles, but their talk show is still immensely entertaining to me. I guess it’s all about the personalities. If you’ve heard the show, then you probably are familiar with their opening theme song, which is a bluegrass tune mainly played on a banjo. (According to their website, it’s a live recording of a David Grisman tune.) Ever noticed how great a tune it is? It’s just this perfectly smooth stream of eighth notes coming from the banjo, perfect pull-offs and hammer-ons, and the melody just stands out in the cascade of sound. When I first started listening to Car Talk years ago, I remember thinking, “dang, it must be so hard to play banjo… listen how insanely fast that banjo is going!” The stream of notes where just a blur, and all you could do was just sort of listen, slack-jawed, and wonder how the guy was performing such a feat. But as I practice my banjo more and more, pick more licks and pick up speed, the magic has gradually dissipated. Over the last year, every time I hear the theme song, the banjo seems to be playing slower and slower. I actually did a double-take this morning when I heard the song. I mean, I can actually visualize what the banjo player is doing. I can hear the exact notes he’s playing, understanding every arpeggio and run and lick. In fact, I’m sure that if I had the recording in front of me, I could transcribe the tab now, and learn to play it myself. Honest! He’s just not playing as quickly as he used to! So I’m finally getting frustrated with my cheap “beginner” banjo. The The pegs are super-cheap; whenever I try to tighten the drum head, they slip off. The action above the 5th fret is terrible, probably due to cheap-neck curvature. The tone is weak, and I’m insanely jealous when I listen to my teacher play his banjo. One day I asked my teacher: “why does your banjo sound so GOOD?”. He said that it was “all about the rim” — it turns out he’s playing a Stelling Bellflower with a Tony Pass rim. What an incredible, punchy tone. It just cuts right through you. It’s funny, I used to think that it was wrong to buy expensive instruments unless you were a truly great player and “worthy” of such hardware. But now I realize that even if you’re still an intermediate player, having a really nice instrument is just an incentive to practice more often… it makes everything more enjoyable! My teacher was right: if having a nice instrument makes you pick it up more often, then it’s worth every penny. It’s a really small banjo world. Every banjo player knows every other one, and the folks who build banjos are even more famous (and just as accessible) in the community. I don’t know squat about banjo construction. I’ve got a lot of reading to do, and a lot of research to do. Maybe I’ll take a drive up to Elderly Instruments in East Lansing, MI, or maybe I’ll head down to visit the Squeaky Animal Studio in Nashville. I’m sure Mark and Marg are surrounded by banjo-crafters and dealers. Until I try a whole bunch of different banjos, I have no idea what “sound” I want, much less how to ask an expert to build one for me. Ah well, all in good time. I’ll keep saving my pennies and doing my research. 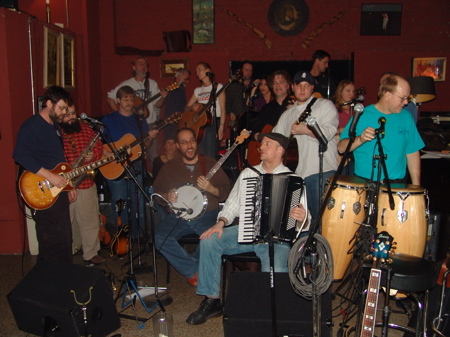 For the last year or two, I’ve been attending a folk-jam every other Friday night. They’re a great bunch of folks, a rotating group of about 20 people, and each week a different assortment of about twelve people show up. It’s an interesting mixture of two generations — a bunch of 50-something year-olds (people who actually lived through the 1960’s), and a bunch of 30-somethings like me. The older generation has been playing together every friday night for about 25 years now. Their repetoire is an interesting mixture of folk, protest, and bluegrass tunes, and they’ve been playing for so long, everyone has everything memorized. I was introduced to the group by my uncle Mark, and they’re really friendly to visitors… though the “all music memorized” thing is a bit intimidating to newcomers. Someone starts playing a song, and everyone automatically joins in in harmony, with N guitars playing, bongos, mandolin, fiddle, keyboards, etc. Luckily, they have a songbook they hand out to guests. When it comes to solos, half the battle is losing your fear. The rest is learning some licks.